X-Press It glue is easy to apply and dries clear. The formula is non-toxic, water-based and acid-free, making it perfect for scrapbooking, paper crafting, fine art, and design projects. 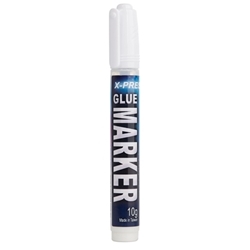 The markers apply quick-drying glue that is ideal for glitter, flocking, embossing and masking. Available in medium or wide nib styles, featuring removable nibs for easy cleaning.